Why watch a game when you can be a part of one? That is a question posed by a group of students as they came together to work to increase attendance at a volleyball game this spring. Emily Brown (left) and Krista Tyson (right) participate in a “halftime” game at the MBU men’s volleyball home game on March 27, 2018, against Ottawa University. Attending a sports game can be exciting, especially when your team wins. But for attendees of a men’s volleyball game at Missouri Baptist University on March 27, there were a couple of additional activities which made the event fun and engaging. Along with the exciting game, a small group of MBU students decided to make the game a bit more interesting with some activities for attendees of the event. The group of students who organized activities for that night were part of the Small Group Communication class at MBU. Students in the class were tasked with developing and executing a service project which would benefit MBU students and the campus. The students in this particular small group decided to try and increase attendance at MBU athletic events, testing out some possible tactics at the men’s volleyball game that night. “The goal of our group’s project was to help increase athletic event attendance at MBU, so we chose to focus on a men’s home volleyball game. We tried to do this by adding a few activities to the game to get people involved,” said Dani Stevenson, a communications studies major at MBU. Deciding on the best way to get people interested in attending the game was a challenge. The group of students decided to go with a raffle, halftime game and a theme night due to the popularity of these activities. Both the halftime game and the raffle went well with several attendees participating. 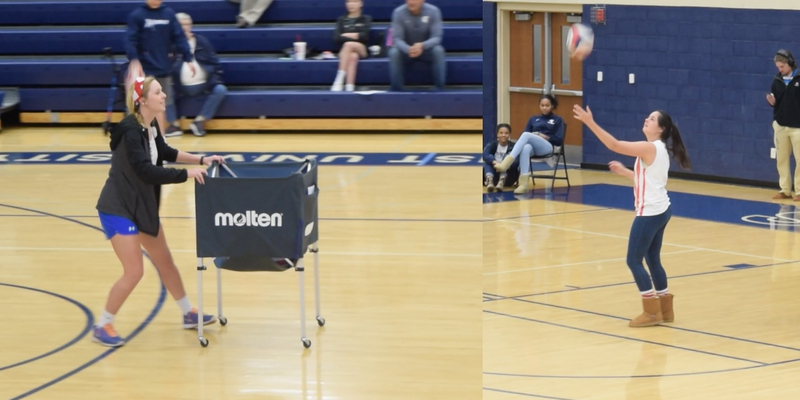 During halftime the group asked for volunteers from the audience to participate in a serving competition, with two groups of two members each, with one person on each side of the volleyball net, explained Danielle Dirks, a senior public relations major at MBU. The object of the game was for one partner to serve a volleyball over the net while the other partner tried to catch the ball in a rolling basket. The winning team received a free MBU T-shirt, a water bottle and a $5 fast food gift card. The other group received a coupon for a free sandwich at Chick-fil-A. Overall, attendees of the game approved of the activities the small group of students organized that night. In addition to being a fun way to get involved, the activities were a positive way for attendees of the game to show their support for their team. The activities were a hit and the MBU men’s volleyball team won the match against Ottawa University. There were several challenges the small group faced when putting together the night’s activities. A big hurdle was communicating with the correct people about putting on the event. In addition, talking with staff members in the Athletic Department about promoting the event was a challenge. But for Michael Carr, Danielle Dirks, Michael Klussman, Torrance Littles, Margaret Sorensen and Dani Jo Stevenson, their hard work paid off. In addition, the group’s service project was an important learning experience and taught them how to work together as a group.